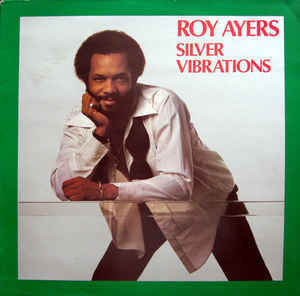 When Roy Ayers released “Silver Vibrations” on his own, newly formed Uno Melodic Records in 1983, he had just ended an incredibly successful decade with Polydor. The albums “Lots Of Love” and “Silver Vibrations” both came out in 1983 and the latter now gets reissue status from the great folks at BBE Music, including a double vinyl LP! The timing is perfect since my own LP copy, bought at the great Reckless Records in Soho, London (which is still around on Berwick Street) is pretty worn out because I played a couple of tracks during my DJ years, notably the still amazingly grooving “Keep On Movin'” and the ultra funky “Good Good Music”. There are no credits to this album, not on the original copy nor on the reissue, but I assume the usual suspects like William Allen, James Mtume, Brian Jackson, Terri Wells, Carla Vaughn, Danny Madden, and Jorge Dalto are part of this trip. The album is a great example for the compelling, mesmerizing sounds of the vibes man with seven tracks between 5 and 8 minutes which still have the power to hypnotize, like the repetitive title track for example. But the slower tracks have that special knack, too. Just listen to the beautiful soul ballad “Smiling With Our Eyes” with its wondrous vocal arrangement, actually really bringing a smile to your face. Or the deep deep midtempo soul swayer “D.C. City” with its reiterating refrain and slick production work. Roy’s vocals are charming and free-flowing as usual and the subtle synth backing and fat bass have made this a classic. Whereas “Chicago”, the album opener, with its quirky and interesting bass line and keys work, sounds as fresh and innovating as way back in the early 80s. And with “Lots Of Love”, recorded in a shorter version for the album of the same name, is the perfect opening track for the upcoming spring season. It’s a feel-good song with fantastic strings, optimistic sax and vibes work, helping to make this album one of Roy’s most fundamental work. Roy turns 80 next year and still performs. Don’t miss him at London’s Union Chapel on April 12th and 13th, the Roseland Theater in Portland (April 20th), the Miracle Theater in Inglewood (May 11th), City Winery in Washington, DC (May 25th and 26th), and San Francisco’s Miner Auditorium on June 22nd.